He is the father of Carl Feynman and Michelle Feynman. He is the brother of Joan Feynman. 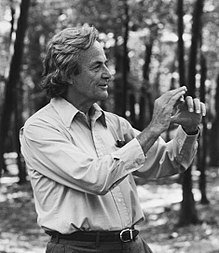 Richard Phillips Feynman (pípè /ˈfaɪnmən/ FYEN-mən; May 11, 1918 – February 15, 1988) je was an American onimo fisiiki ara orile-ede Amerika. ↑ 1.0 1.1 1.2 1.3 1.4 1.5 "Richard Phillips Feynman". Mathematics Genealogy Project (North Dakota State University). Retrieved 2010-03-18. Àtunṣe ojúewé yi gbẹ̀yìn wáyé ni ọjọ́ 21 Oṣù Kẹjọ 2013, ni ago 13:16.